A publication of New Moon Publishing & Consulting - California, USA. Thanks to Ozzy Osbourne and Robert Plant for this beautiful mystery of influence, because as the story goes from an interview circa 1990, Ozzy Osbourne & Robert Plant had been conversing on "the deep & meaningless about music". In that summer of 1990 by the pool at the Biltmore Hotel in Phoenix AZ, I had asked Robert what that conversation with Ozzy was all about in regards to "the deep and meaningless". Having remembered the conversation, Robert carried on in detail about the making of music, rock n' roll including all that is of pop, glam and other such important things in life, and Robert's summarized his point in saying: "Everything is meaningful." To Robert everything is meaningful, including the simple honor of asking his son, Logan Plant, to listen to his mother. And by Robert's request, I called to Logan there by the Biltmore pool and said, "Logan, listen to your mother." And so the mystery of influence continued. Now it's 2005 and it's quite amazing how something done so many years ago affects what is created so many years later, including what we are creating in the present. It was the very honor from the respect of listening to one's mother that one legendary guitarist became so important in the life and solo works of Ozzy Osbourne and so many more, in this case it was legendary Blizzard of Ozz guitarist, Randy Rhoads. Randy listened to his mother at her Musonia School of Music and learned. He learned; he taught, and he became a legendary guitarist through his work with Ozzy Osbourne. 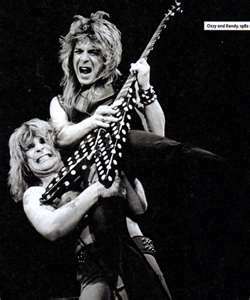 And thus, one of the greatest past duos in rock music history Osbourne & Rhoads created the music of "Blizzard of Ozz" and "Diary of a Madman", adding to the cornerstones and of metal rock music history affecting great influence through the world of music. It's Friday the 13th, May 2005 and Ozzy has reunited once again with the original members of Black Sabbath now on tour with "OZZ FEST". Ozzfest Tickets have gone onsale. See Ozzy with Black Sabbath on the tenth anniversary tour off Ozzfest. (See details on special tickets at www.OzzFest.com) Mrs. Delores Rhoads is still teaching at the Musonia School of Music. And Robert Plant is on tour with his newest album, THE MIGHTY REARRANGER (details at www.RobertPlant.com). * Randy Rhoads was devoted to his first love, classical music, and hoped to enroll at UCLA to earn a music degree. In 1989, with a gift of $50,000 from a trust fund of Randy's career earnings, his mother established the Randy Rhoads Memorial Scholarship Fund for the study of classical guitar at UCLA. The scholarship reflects Randy's and Mrs. Delores Rhoads's commitment to music education. For more information regarding donations and/or eligibility for the RANDY RHOADS GUITAR SCHOLARSHIP FUND for classical guitar studies, contact the UCLA School of Arts & Architecture http://www.arts.ucla.edu/support_ucla/primary_f.htm "Love is a mystery with an influence of no limit. What if there is no what if. Call it Fate, the present is a gift" - Melanie Silos. But first, how about a little history... Back in the late 60's in the small town area of Birmingham, England, major roots developed in the world history of music with neighbors who were to become legendary rock vocalists of legendary rock bands: Black Sabbath's Ozzy Osbourne, and Led Zeppelin's - Robert Plant. From the evolution of the Yardbird's, Led Zeppelin released their first self-titled album in 1968. Known for their dark, mysterious side of music, Black Sabbath, released their first self titled album on Friday the 13th of February 1970. Even after creating the legend and the parting of their bands, both Ozzy Osbourne and Robert Plant carried on into their solo careers. And little by little their influence permeated the world through music both from their legendary rock groups and their solo works.